In last week’s Ask Rob, I discussed how conducting an internal analysis should be your first step in mapping out your 3-Year Highly Achievable Goal (3HAG). Not only can this process help to deliver clarity on what you and your team need to do to achieve your 3HAG, but it can help to shorten the amount of time it takes you to get there. You should never underestimate the importance of a functional organizational chart, as you want the right people in the right places around your company to improve your chances of success. The next step you should take as you prepare to develop your 3HAG is to conduct an internal analysis on your key processes for making money. How can you improve on them to make your business run more efficiently? Who is held accountable for each process? Where do you have a strategic advantage in your industry? Are you able to identify your “X Factor,” the key differentiator that sets you apart from everyone else in your market? 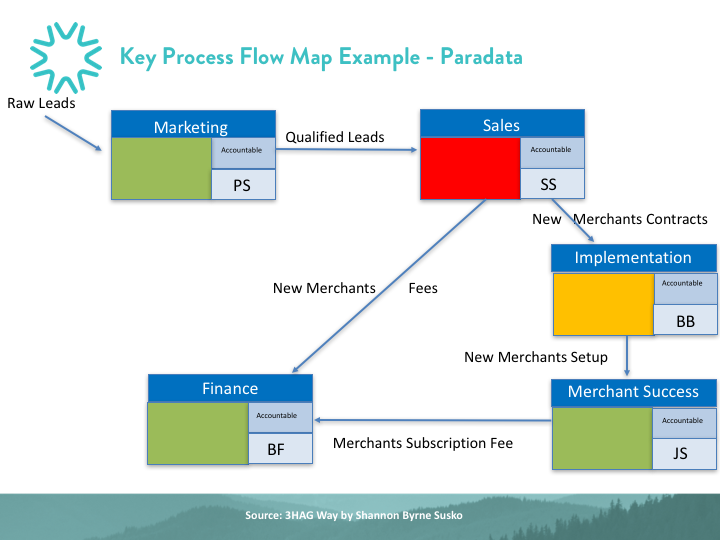 Develop a diagram that maps the key money-making processes you identified. Let’s review the example below as a starting point. Sales receives the qualified leads, as it’s their job to sign the customer. Finance generates the invoice and collects the money. In this example, 50% of the contract is paid upon contract execution. The implementation team connects with the customer once the contract is signed. The merchant success team enters the picture after the customer is implemented. Finance gets involved again as they bill and collect the other 50% of the contract. After you’ve mapped out this flow, your next step is to identify the one person in your company who is accountable for each function and write down their initials next to that function. Then, identify the key leading and lagging metrics that each function should produce when successfully operating at an optimal level. I recommend color-coding each function as to how it’s currently in delivering on those metrics. Once you’ve got your key process flow map completed, post it somewhere where it can be referred to on a regular basis. Keeping these processes top of mind will help you with strategic analysis, operations flow, and accountability, all of which are crucial to achieving the 3HAG you set for your business. If you’re interested in working through your key process flow map, or you need suggestions on how you can make your key money-making processes more efficient, reach out to me. I’d love to help you get cash in your bank sooner.